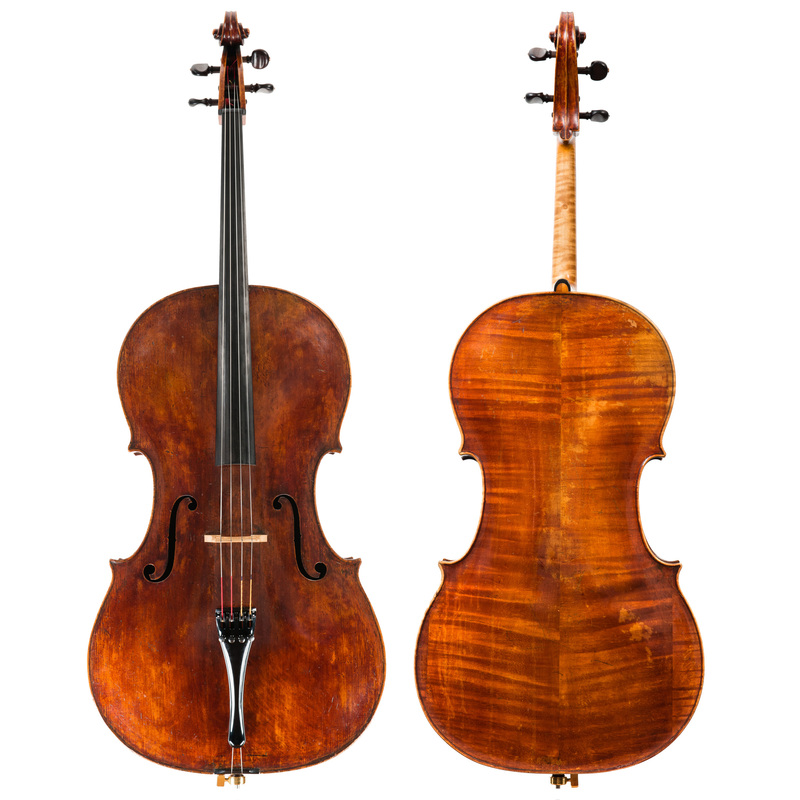 Carlo Tononi Venice, c1720 "Ex Salmond"
When we were offered this extraordinary cello though a friend in Europe we immediately recognized that we could not miss the opportunity to acquire such a rare instrument. The fact that it’s not been reduced in size and still has a huge amount of original varnish places this cello in the realm of an historic treasure. When we set up the cello the sound was equal to its looks – a bass that cellists only dream of, and an A-string with a warmth and nobility that carries into the lives of the listener at the back of the hall. For most people it’s a perfect cello. Its known history is only traceable through the W.E. Hill & Sons certificate that states the cello was owned by Lord Clonbrock. We haven’t been able to determine whether it relates to the 4th Baron Clonbrock who died in 1917 or the 5th Baron who died in 1926 and consequently do not know exactly when Felix Salmond (1888-1952) purchased the cello. Even if he already owned the cello prior to the Hills certificate of 1947, it is unlikely that he premiered the Elgar concerto in 1919 on this instrument. 1919 was the year Salmond bought the “Piatti” Goffriller. What does remain significant is that Salmond played the Tononi till the end of his life, suggesting that he also found it easy to play. Felix Salmond moved to the United States in the early 1920s. His influence and teaching revolutionized cello playing in this country. He taught at the Juilliard School and from 1925 at the Curtis Institute with such future giants as Leonard Rose, Bernard Greenhouse, Samuel Mayes and Orlando Cole among his pupils. After Salmond’s death the cello was sold by Willaim Moennig in Philadelphia to Edwin Scholz. As a cellist Scholz’s studies at Oberlin and Juilliard led him to a performance career particularly on the East Coast. But in 1970 an unexpected opportunity to conduct developed into a successful life for him in Germany. It was from his family that the cello was recently acquired.